Bucket Filling Program - What's Happening in Mrs. Shirey's Classroom? The idea of Bucket Fillers is based on the book "Have You Filled A Bucket Today? (A Guide to Daily Happiness For Kids)" by Carol McCloud. The premise of the book is this... We all carry an invisible bucket that contains our feelings. When our bucket is full, we feel great. When our bucket is empty, we feel sad. A bucket filler is someone who says or does nice things for other people. By doing this, they are filling other people's buckets and filling their own bucket at the same time. 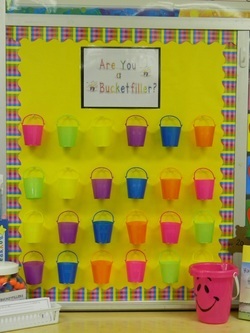 In our classroom, each student has a bucket on our Bucket Filler bulletin board. Everyone is encouraged to fill the buckets by writing kind words and compliments to each other. At the end of the week, we will empty the buckets and read the nice things our friends left for us when they filled our buckets. I will also recognize students throughout the day for their bucketfilling actions. They will receive a pom pom for their bucket. Once their bucket is filled they will place a sticker on their bucket. At the end of the year the students will take their buckets home as a reminder to keep being a bucket filler! I am very excited to implement this new program in my classroom! I hope your child enjoys the journey towards becoming a life long bucketfiller. This is a picture of our Bucketfiller bulletin board. Each student has their own bucket. 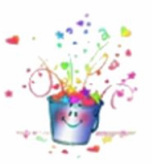 During the week buckets are filled with colored pom poms when "caught" showing good character. This is a picture of our take home bucket fillers. *the book: Have You Filled a Bucket Today? This activity explains the Bucket Filling program to the parents and family members of each student. They are encouraged to practice bucket filling at home along with using the compliment forms. Once the activity is completed the students and family members post their comments on our Bucket Filling Blog.